I wonder if Heather Blitz ever imagined that sharing wonderful Paragon videos with the world might have a down side. Specifically, would she ever have predicted she'd get picked apart by some cheeky blogger who is perennially "schooling second level." This is not so much a critique (I greatly admire her riding, actually), as a blogger wondering aloud. The question: must my position fit the classical mold 100%, or might there be room for individual variation?I love Heather's riding, I love to watch her hands, and I appreciate her quiet influence and tactful authority. She looks more like an all around horsewoman than a dressage rider per se -- like she could transition easily to show jumping, hunters, or reining. I have pondered HB's position, and to my amateur eye, her dressage position differs from what I have come to believe is desired/ideal. 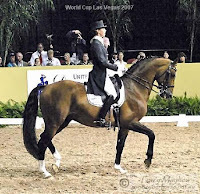 Her stirrups seem a bit shorter, and there is more angle in her knee, than other dressage riders at her level. While her upper body is erect, her shoulders are -- well -- almost a little rounded. She does not seem to sit quite as deep as other dressage riders. Compare Heather's position to Courtney King-Dye. Different, yes? Maybe I haven't seen enough upper level riders, and they differ more in their position/style than I realize. Again, I don't mean this as a criticism -- she's obviously very talented. Then why do I pose these questions? For selfish reasons, of course! As a tall rider I find myself tending to continue a lifelong habit of hunching while I ride. I have to fight it with every stride. Also the classic long dressage leg, with the ball of the foot just barely reaching the stirrup, is difficult for me -- can't keep my leg quiet. Could Heather's position be an adaptation for a female rider who is especially tall? So, am I looking for a good excuse to continue my slouching ways? Am I imagining these position traits? Help me out here! This is an interesting topic... I had never thought about it, but really, there must be some allowances for variation, simply because of rider physiology. Although maybe that's not as much of an issue at the upper levels? Hmm. What I really noticed is that in Heather's second picture her leg appears to be much farther forward than in either her first picture or that of Courtney King-Dye's. Although AC is right, it's hard to tell where they're at in the movement and whether or not they're cuing, it's just that her leg position is more forward than I personally like to see. Yeah the first thing I noticed in the second picture of Heather is that her shoulder, hip and heel don't line up. In the first picture they line up but she looks like she has her leg back giving a cue, so if she put it down again would it be in front of her body? I think it might, although it is hard to tell. I do agree that her stirrups might be too short and she's not pushing down through her knee, but that is only an amateurs guess. I'm not going to get involved in how her shoulders look...but you never know, there could be a physiological reason for her riding with shorter stirrups than most would expect. 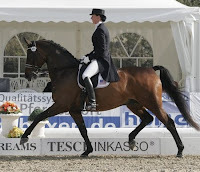 Many people think I ride relatively short in dressage...but as much as I've tried, I don't think I could go much longer. Since I could remember, my hips have not been as flexible as they should, & as a result, I have difficulty in stretching my legs down to ride at a length that most people would think was normal. I know next to nothing about dressage, but I find your posts interesting and informative. I feel like I'm always learning something new here! 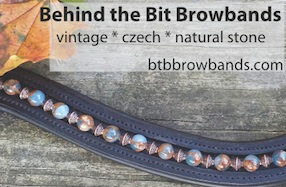 BTB - I am so happy you have asked this question. Ms. Blitz is a student of Mary Wanless, who has written several very interesting books on the biomechanics of riding. She challenges the standard interpretation of classical dressage position. Specifically she addresses the sitting up tall and riding with the longest stirrup possible. She maintains that a shorter stirrup (more angle at the knee) and a tighter upper body position (more like a fencer or martial artist might adopt) are much more effectual. I was just introduced to her ideas last year (by a riding student) and I have studied her since. I would recommend her book "For the Good of the Rider" as an excellent, detailed look into her ideas. But, I warn you, it is a dense, sometimes difficult read. "Ride With Your Mind Clinic" has pictures and is a much more fun read, but it seems that she expects you to already be familiar with her concepts. Even if you don't buy into it hook, line and sinker, it is interesting to read something so vastly different from what else is out there. Stacey, have you read this article? http://equinestudies.org/whos_built_best_2008/whos_built_best_2008_pdf1.pdf It is mostly about anatomical differences between men and women and how those differences effect riding. But I imagine that there might be some wisdom in there in regard to what you're talking about with height/different riding styles. Hi Mandy, I have read and re-read Ride with your Mind! I can see how her principles apply. Personally I took a lot of what Mary Wanless said to heart, and unfortunately misapplied it -- needed to learn the difference between the tension necessary to create energy and tension that blocks. But in the long run her principles helped me quite a bit. I hadn't realized that the shorter stirrup was something to be carried through up the levels. In her first book it seems she recommends it mostly to help her riders be more effective "in the place they were at at the time." But before I read that book I did not "get" how important the core is. I was looking at your photos, being largely unfamiliar with either rider's technique, and thinking "I look more like Heather". Then I got down to your "because I'm tall" and thought "Oh ya, me too". I'm 5'9" and show a 15hh cobby horse ("I'm not fat. My mom says I'm 'baroque'!"). I also have scoliosis, little muscle despite working out, and big "headlights". I have a heck of a time keeping my tail-bone tilted down and my shoulders back. My center of gravity is up around my "headlights" and my scoliosis rounds my shoulders. If I ride with long stirrups, my legs - lacking any sort of tendon strength - bounce too much. And my horse's massive barrel pushes them forward. I try to do things "right" but I also want to be "effective". I'm glad you brought this up. I've been pondering this a lot myself. My friend and fellow working student is my same height and weight, but saddles that fit her, are too small for me. We lined up in front of a mirror and lo and behold, our knees didn't line up! So I've been reading and re-reading my centered riding book and thinking about the geometry. You just cant make the same triangle (hip, knee, ankle) with every leg. I dont claim a very thorough understanding of the physiology of riding, but my geometry has always been good. If your goal is freedom in the hip, your center of gravity over your seatbones, freedom of the lower back, etc. I'm pretty sure there have to be physiological accommodations. That being said, I wonder just how much variation we're talking about here. Clearly we need to get lots of respected, even pictures up here to inspect. Maybe even do some conformation type analysis to each rider. another point to look at as far as how rider position effects the horse....comparing the two piaffe pictures again, Heather's horse has a much lower croup, and his hind legs are well under his body, this is a picture of what I would say a textbook piaffe should look like, Courtney's horse has his legs further out behind him, his back is not as lifted, etc. Not knocking Courntey but I would say from the pictures alone Heather's position allows the horse to use himself more effectively. As others have already mentioned, Heather Blitz is a disciple of Mary Wanless and her seat and position does reflect those teachings. I had the opportunity to audit one day of a Mary Wanless clinic about two weeks ago. I'd already read her books but having her explain/demonstrate in person helped it all make more sense. Wanless talks about "stacking the torso" so your body is in alignment and warns against riders who arch their backs and throw their shoulders back explaining that a rider's core strength is compromised by that position, much as a hollow back on a horse keeps him from using his abdominal muscles effectively. On a personal note I've been concentrating on bringing my body more into alignment and have found that it releases a lot of tension in my lower back. There definitely must be accommodations for rider body proportion, however most body types can get into a biomechanically effective position. For moments during movements your body alignment may be out of "alignment" but should go back into the biomechanical neutral position afterward. The shorter leg is essential to give you a base of support, be able to move your seat around, and allow you to use your leg to its best ability. (Seems a crew of tall people are commenting here but this principle applies to any height. I am 6 foot too.) Then there is the problem the previous commenter made about dangling legs... very true! If you really want to tackle body position I recommend getting a clinic organized in your area with Jeff Moore who specializes in biomechanic of the horse and rider. He clinics throughout the nation! I think its not so important to get wrapped up in little details with positions. The most important thing is to be in balance with your horse so you don't get in his way or block movement by sitting to one side pushing down with one seat bone or another. The other thing with Dressage is that the position is something that is fluid depending on what you're asking the horse to do. There are three different leg positions used in the course of riding and each combined with other aids, tell different things to the horse. Having a long leg and tall straight back make it easier to move your leg into the necessary positions, while remaining balanced, without getting in the way of the horse. 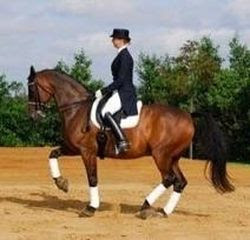 However, if having the stirrups too long makes the rider unbalanced, it's much better to have a shorter stirrup length. My opinion anyway :-) I'd rather see someone sit quietly in the trot with a shorter stirrup than have a swinging leg and insecure seat with a longer one. One other note to Rachel who talked about lack of flexibility in her hips. I had that problem for years, it is what made me abandon jumping in favor of dressage. I just couldn't fold at the hips properly. This year I got into the gym in a serious way, 3 times a week, lifting weights, and doing a ton of squats and deadlifts, both high reps with low weights and low reps with high weights, and it has made all the difference in the world. All these years I felt hindered in my riding, and thought the problem was unfixable. I was very happy to discover I was wrong, but it did take a lot of work.